Ratings are averaged based on 21 reviews. If your looking for a truly 5 star experience, this is your place. Outstanding customer service, with staff going above and beyond to make your stay pleasurable. Its really lovely for families with children also. I will be back very soon! A superb hotel. The refurbished rooms are gorgeous. Beautiful grounds filled with trees and birds. Very attentive and friendly staff. We had a wonderfuuly relaxing holiday. When we arrived and got to our room and stood on the balcony we had the most beautiful view of Paradise !!!!! the Intercontinental was just fantastic and we would definitely stay there next time we go. We are biased as this is probably our favourite hotel anywhere. The rooms and grounds are great and even the beach is spotless which in Bali is always a plus. We have been staying here at various times for over 5 years and the staff never fail to impress with their level of service and friendliness. Without a doubt the most stunning, clean & friendly resort we have ever stayed. We simply didn't want to leave. Stunning at every turn and staff so kind and friendly. Breakfast buffet to die for and the atmosphere quickly made it my favourite time of day. The service from all hotel staff was excellent. They have bent over backwards to help us organise a family celebration. Could not fault. Hotel restaurants were good but limited eating places nearby. About 30 minutes by car to Seminyak with lots of restaurants. We found the inter-continental the perfect place for our holiday. The resort by all accounts is one of the older locations in Bali, however it is maintained to a very high standard and has all the facilities you need for great holiday. The staff provided exceptional service and were always willing to assist and make sure you had a good holiday. The location on the beach is perfect, you can sit in the pool and watch the sun set over the ocean while you relax. The rooms are great, the staff fantastic. In spite of the extensive renovations going on, the hotel was just as quiet and enjoyable as ever. The InterContinental was a beautiful resort and the staff were very friendly and helpful. Great resort. Staff were excellent and food great. Very well maintained resort. Departure lounge at the hotel for late departures is excellent. The resort might be in need of some enhancement however the cleanliness and overall relaxation feeling of the hotel makes up for any cosmetic needs. We travelled as a family - two adults, an 8yr old and 5yr old and all four of us absolutely loved the resort. My 5yr old lived in the water, whether that be the swimming pools or the beach. My husband and I had been to the Intercontinental about 16 yrs previously and cannot believe the quality of the building itself and how beautifully maintained it is. The only small negative was kids club - my children did not enjoy at all and did not find it fun. However, we travel as a family to spend time as a family so it didn't affect our holiday at all - the pools were a lot more fun and my husband and I still managed to get in a massage each and plenty of cocktails at the Sunset Beach Bar. We were in the Intercontinental Hotel after 3 week trip around Australia and Bali and is the perfect place for relax. Placed in front of the beach you have both the beach and the swimming pool. From the moment we arrived and until the moment we left, the staff at the Intercontinental Hotel could not do enough for us. It is a wonderful property made even better by the staff. 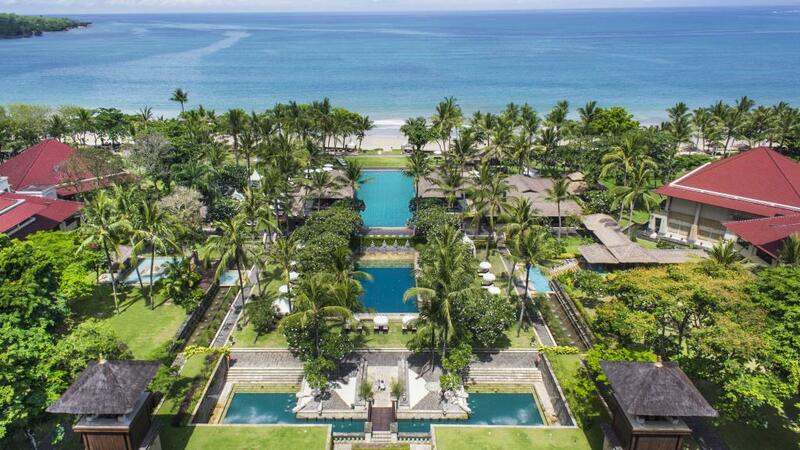 Beautiful large resort set in lovely gardens directly on Jimbaran beach. The location is exactly what we wanted with the resort's great main pool being just off the beach. The rooms were lovely with traditional styled furnishings, good size and our room (we had 2 interconnecting for 2 adults & 3 children) was in a good position - the resort is very big but it was a nice walk through the gardens to the pool & other areas. The poolside breakfast buffet was amazing & cannot fault the amazing service. The several other restaurant options of the resort all looked amazing but we did not use as not as suitable for young children but with easy access to the many beach seafood restaurants we were happy with that. The most wonderful place. I loved it and so relaxing, thoroughly recommend it and will return hopefully soon - gorgeous. Lovely hotel with beautuful grounds. Drinks and dinners are very expensive though. It was a great location and beach was clean, with expansive gardens. The Intercontinental was just perfect. It is an older property but well looked after and per fectly located in the quieter area of Jimbaran Bay.The staff were just lovely and made every effort to make the stay as enjoyable possible.